You are here: Home Theatre What would Shakespeare do? Bard on the Beach almost never presents plays that are not written by the Bard himself, but when they do, it is for good reason. Bill Cain’s tale of art and politics is a masterpiece of suspense and humour played by a cast of six talented actors. It is presented in partnership with the Belfry Theatre in Victoria, where it premiered this spring. The story is set in Jacobean England in 1606 as Robert Cecil (Anousha Alamian), King James’ Prime Minister implores Shagspeare (Bob Frazer) to write a play titled The True Historie of the Gunpowder Plot. Shagspeare explains that he writes histories and plays based on events that happened in the past, but he does not do current events. The gunpowder plot was a terrorist plot led by Guy Fawkes to assassinate King James I and blow up Parliament, and Cecil is adamant that Shagspeare be the playwright to bring the story to life at the King’s request. Shagspeare has no choice but to agree and accepts Cecil’s payment. Under the direction of Richard Burbage (Gerry Mackay), Shagspeare and his Globe Theatre company (Anousha Alamian, Anton Lipovetsky, Shawn Macdonald) attempt to translate the story to the stage. As they delve further into the plot, they realize that the King’s version of the story might not be true, and they are forced to decide whether they can perform a story that they know to be false and damage their artistic integrity, or risk their lives by revealing the truth. Bob Frazer is outstanding in the starring role of Shagspeare, and the relationship he has with his daughter Judith (Rachel Cairns) is so poignant. Judith has a beautiful soliloquy in which she laments about her disdain for soliloquies and plays in general, and I loved the moment when Shagspeare can finally look at Judith without grieving the loss of her twin, Hamnet. Anton Lipovetsky as a young King James, with his high-pitched voice as he called for his “Beagle” (Robert Cecil), was hilarious. Lipovetsky also played Sharpe, one of Shag’s actors who needs plenty of encouragement. Alamian as Cecil was also very impressive as he immediately switched from the limping, humpbacked Prime Minister to his other role as one of the actors. Directed by Michael Shamata, Equivocation is full of references to the bard’s plays and humorous lines from Cecil about his work lasting at least 50 years. He also remarks that Shagspeare has the unique ability to make fun of a group of people during his plays, but have them laughing by the end. The construction of the play’s scenes is quite complex as they are interwoven and involve many quick character changes for the actors, but this cast seemed to pulled it off with ease and it was not difficult to follow. 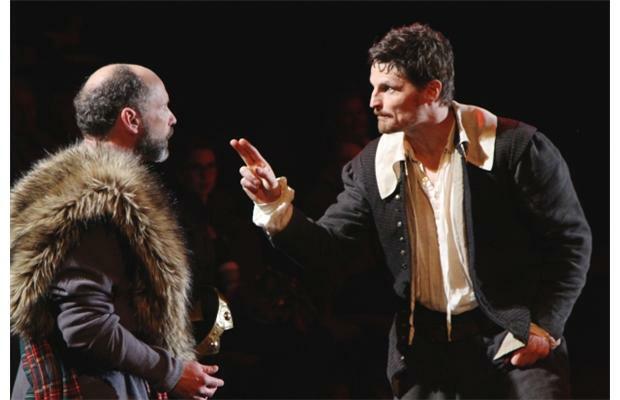 At its core, Equivocation is about posterity and how to tell the truth in difficult times, and it tackles these themes with intelligence, humour, and plenty of intrigue. According to Shagspeare, “We are all fools, we are all noble, we are all royal.” He tells his company of actors that they can play any role because they have it inside of them already. It was wonderful to get this glimpse of what it might have been like as Shakespeare directed his actors and dealt with the realities of being under the rule of the King. Equivocation runs from July 2 to September 19 at Bard on the Beach in Vanier Park. For more information, visit bardonthebeach.org.